A stellar example of this ideology in practice is the Currituck Banks Coastal Estuarine Reserve. Located on the borders of Corolla and the 4WD accessible areas of Carova, the Currituck Banks Coastal Estuarine Reserve is 965 acres of natural maritime habitat. Visitors are free to explore the nature trails that wind through the area for some of the Northern Outer Banks' best fishing, hunting, birding, hiking, photo ops, and wild discoveries of how all of the barrier islands of the Outer Banks used to be decades and even centuries ago. The northern portion of the Outer Banks, namely Corolla and Carova, was more or less deserted for centuries, inhabited only by the local Poteskeet Native Americans. European explores would pass by en route to Virginia or neighboring Roanoke Island, which was settled in the 1580s, but relatively few ever came to shore on Corolla and the Currituck Banks, which were dark, desolate, and protected from foreign explorers by an ocean border of shifting shoals and sand bars. In fact, it wasn't until the mid to late 1800s that small fishing and farming communities began to pop up, populated by mainland or neighboring barrier island transplants, as well as the families of the lighthouse keepers and servicemen of the area's lifesaving stations. The area soon became popular with sport fishermen and hunters as well who heard rumors of the unspoiled beaches and fantastic wildlife, and would make miles-long treks across empty beaches to get there. The Whalehead in Historic Corolla in Corolla is one distinctive relic of this first generation of wealthy outdoorsmen, who were the first vacationers to fall in love with the Northern Outer Banks' wild landscape. By the 1970s, however, rapidly growing vacationer interest as well as the development of a paved road to the Northern Outer Banks towns of Duck and Corolla had caused development to boom, with new businesses, homes, accommodations and even hotels beginning to pop up along the natural landscape. As a result, several large parcels of land were donated by locals, off-island land owners, or simply reserved by the state and federal governments to remain natural locales for local wildlife to flourish. One such parcel was the Currituck Banks Coastal Estuarine Reserve. This area was one of three original components of the Currituck Banks that was dedicated by the NOAA and the Division of Coastal Management in 1985, and was reserved and protected due to its distinct and completely unique ecosystem. As a result, countless habitats for fish, reptiles, birds, and even the famous Corolla Wild Horses have been careful preserved in their natural condition. The Currituck Banks Coastal Estuarine Reserve is, in fact, a wonderful example of a low-salinity estuarine system. This term basically refers to the nature and subsequent landscape of a migrating barrier island. Throughout the centuries, the islands of the Currituck Banks have basically been moving, at a glacial pace, to the west, creating marshes and saltwater streams stemming from inlet deltas and over wash fans that were directly affected by changes in rising sea levels. Another factor leading to significant changes in the Currituck landscape is the influx of fresh water. For centuries, the northern barrier islands of the Currituck Banks were separated by a small series of inlets, but one by one, they all started to close as larger inlets along the Outer Banks, like Oregon Inlet or even Hatteras Inlet, began to open, encouraged in no small part by passing nor'easters and hurricanes. The last inlet on the Currituck Banks closed in 1828, leaving the island more than 60 miles away from the closes saltwater inlet. Because of this, Currituck Sound does not have regular deposits of saltwater, and as the decades have passed, the waters of the soundside have gradually changed from strictly salty waters to more freshwater environments. In addition to this movement and barrier island changes and adaptations, the warm Gulf Stream Current and cold Labrador Current that intermingle just offshore create a unusual habitat where both northern and southern species of plant and animal life can survive. In fact, the Currituck Banks are the southernmost home to a number of northern species, and the northernmost home to many southern species. The result of all of these factors is a completely diverse range of habitats, which is exceptionally phenomenal for the reserve's relatively small size. This nearly-1,000 acre parcel of land is home to ocean beaches, sand dunes, shrub thickets, grasslands, maritime forests, freshwater marshes, saltwater marshes, tidal flats, and sub-tidal soft bottoms. And all of these minor ecosystems accommodate and serve as a home for countless species of fish, birds, reptiles, mammals and plants. After all, the Currituck Banks Coastal Estuarine Reserve spans from the borders of the Atlantic Ocean west to the Currituck Sound, and is essentially and quite literally a "slice" of wild barrier island life. The completely unique ecosystem of the Currituck Banks Coastal Estuarine Reserve allows visitors to view a range of wildlife, from migrating birds to both fresh and saltwater fish. Perhaps the reserve's most famous residents are the Currituck Wild Horses, which were relocated here from the bustling town of Corolla in the 1980s to protect them from the busy traffic and population influx along NC Highway 12. While the horses tend to navigate throughout the entire 10+ mile region of the northern Currituck Banks, and stay away from the humans who pop up from time to time, reserve visitors have their best chance of spotting them meandering along the beach or the high and dry sand dunes where they are protected and shielded from the majority of visitors. As for fish, there is a rich supply of both game and commercial varieties in the area, in the Currituck Sound, the intertidal pools and ponds, the brackish marshes, and even in some small pockets of freshwater. Varieties include largemouth bass, yellow perch, tidewater silverside, pumpkinseed, blue-spotted sunfish, bluegill, black crappie, and channel catfish. In addition, observant vacationers may even stumble upon white perch, carp, shad, herring, and even eels. Because of this, visiting birders to the reserve, (and particularly off-season visitors who explore the area from November to March), may spot dabbling ducks, diving ducks, white swans, and Canadian geese. Other notable residents, (who occasionally stick around year-long), include osprey, Wilson's plover, black skimmer, and least tern. The birds take up residence all along the reserve, from the shorebirds of the ocean wash to the egrets or ibises hiding out in the brackish marshes. Birders should be sure and bring their binoculars, their camera, and their guide books, as with hundreds of species passing through on a seasonal basis, there's no telling what you'll spot during your reserve travels. It should also be noted that because of this wide range of species, and large number of migrating waterfowl, the Currituck Banks Coastal Estuarine Reserve has been designated as a part of the North Carolina Birding Trail System. As for mammals, there are plenty of wild critters to encounter besides the fames wild horses. The reserve is home to mammals of all kinds, hiding out in the maritime forests, the sandy dunes, and the muddy flats bordering the Currituck Sound. Special species of note include muskrats, nutrias, river otters and minks, as well as white-tailed deer, gray foxes, raccoons, opossums and even occasional feral hogs. While most visitors will rarely encounter these mammals, which as a rule of thumb are shy around humans, a quiet lingering through the reserve, especially in the evenings around the maritime forests, may very well present visitors with a local furry resident sighting. While the aforementioned species are all relatively common residents of a barrier island ecosystem like the Currituck Banks Coastal Estuarine Reserve, the area is also a safe haven to a small number of threatened or endangered species as well. Migrating or visiting species include the American Bald Eagle, piping plovers, and even Peregine falcons that can make a seasonal fall appearance on the Outer Banks. In addition, during the warm months of the summer from late May until mid-October, the barrier island is a regular nesting ground for loggerhead or green sea turtles, which will travel miles inshore from the Gulf Stream to shimmy up the coastline for a night and lay their eggs. Summer visitors may notice portions of the beach that are sectioned off by rope and thick swatches of black plastic. This serves as a protective barrier for the turtle eggs, to protect them from human foot traffic, and also to provide a light barrier for when they hatch. After hatching, the baby turtles' instincts guide them to the small shimmering lights off the ocean, to start a year-long swim towards the Gulf Stream. By blocking out the lights from the villages and communities in the villages, the turtles have no distraction or confusions to sway them off their path to the sea. The easiest way to explore the area is to head north to the beach access ramp located at the very edge of Corolla, and the end of NC Highway 12. From here, visitors can settle at a parking lot which borders a 1/3 mile boardwalk that extends all the way to the water, presenting spectacular views of the Currituck Sound, or continue along the beaches in a 4WD vehicle for northern reserve access. Note that the parking lot is for two-hour parking only and is designed for short-term visitors, but the good news is that this sound boardwalk is handicapped accessible, allowing all visitors to tour the site. 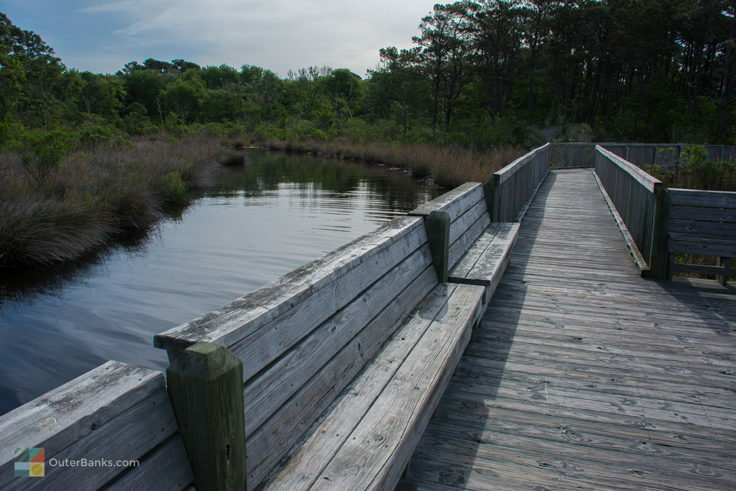 From this small boardwalk, vacationers will also find a more rustic 1.5 mile trail veering off the well-marked path, which leads into the deep patches of the maritime forest to the north. 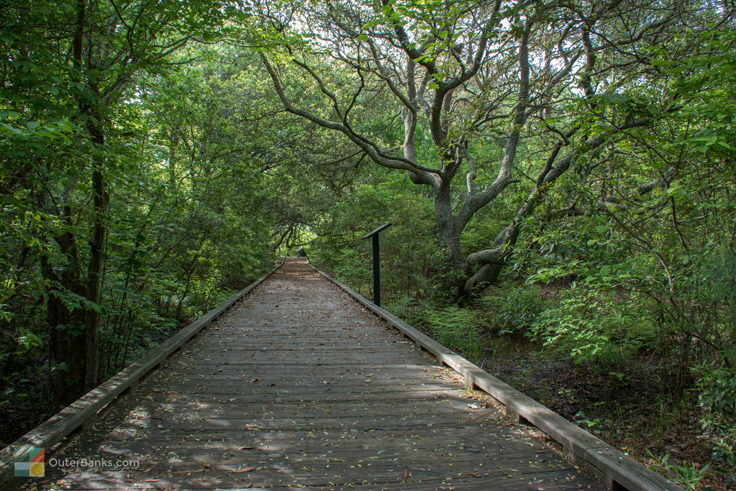 Ideal for hikers, this path extends throughout the reserve and beyond, touching upon the different habitats located within the barrier island. Visitors are encouraged to stick to the designated trails, as certain areas of the reserve, particularly the fresh and salty marshes, can be incredibly difficult to traverse and unexpected visitors can accidently disturb the local wildlife. 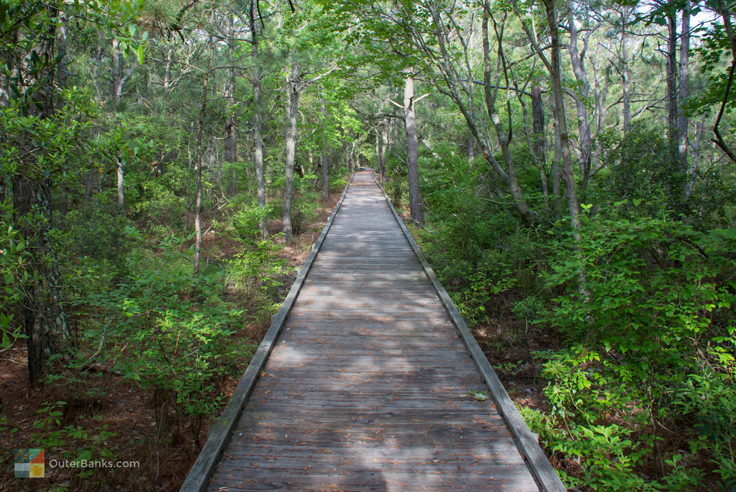 This longer trail also extends, in a slightly crooked route, all the way to the Currituck Sound, so a camera is arguably a must, particularly for evening visitors who are en route to the waterfront in time to catch a sound sunset. Summer visitors to the reserve, particularly hikers who want to explore the entire length of the 1.5 mile trail, are advised to bring plenty of bug spray and sunscreen. The mosquitos on the Outer Banks can be especially thick near marshy and unpopulated areas, and the reserve has an abundance of both. Winter visitors need not worry as much, however even a sunny January day can cause a small sunburn, so a little protection can come in handy. As is tradition in the area, hunting is allowed within the reserve, provided that hunters follow the NC Wildlife Resources Commission, NC Coastal Reserve, and Currituck County rules and regulations. In essence, hunters are required to have both a valid North Carolina state hunting permit as well as an NC Coastal Reserve hunting permit, and are instructed to only hunt during appropriate hunting seasons, which are generally in the winter months. The NC Reserve permit can be printed out online at the reserve's website, http://www.nccoastalreserve.net/About-The-Reserve/Reserve-Sites/Currituck-Banks/57.aspx, and can be delivered in person to the reserve's main Kitty Hawk office located on 983 West Kitty Hawk Road. Hunters are required to report all successful harvests, and are asked to participate in two ongoing wildlife studies that simply require a quick survey and a little observation while on the hunt. Visitors are asked not to remove any plants, disturb any wildlife, or have any camp fires. In essence, don't plan on leaving anything behind at the reserve, and don't take anything with you when you go. The reserve asks that when you visit, please "leave nothing behind except your footprints." Pets are allowed on the two nature trails, provided that the owners keep them on a leash, and clean up after them as needed. When it comes to the local wild horses, it is illegal to intentionally come within 50 feet of one of these feral creatures. That said, visitors who encounter a wild horse are encouraged to keep a quiet distance and snap as many pictures as they can - a wild horse spotting can be a rare treat, and also a complete highlight of any Corolla vacation. Make sure you bring your camera. The one-third mile boardwalk is a fantastic evening exploration, particularly on clear days when the sound sunsets are at their best, and birders and hikers alike never know what they might encounter while on the trail. By bringing your camera, you're sure to capture those unique bird and wildlife spottings, and fantastic natural Currituck landscapes, resulting in some of the best photos of your vacation. Find yourself hooked after a visit to the Currituck Banks Coastal Estuarine Reserve? Then consider getting involved. The reserve is always looking for volunteers to lend a hand in all aspects of the natural protection and preservation business. From field research assistants to office assistants, educational leaders to clean-up volunteers, the North Carolina Coastal Reserve system has a number of positions available for local volunteers at their numerous reserve sites located all along the Carolina Coastline, including at the Currituck Reserve. Stop by the Kitty Hawk office to learn more, and visit their website, http://www.nccoastalreserve.net/Resources/Get-Involved/81.aspx, to learn more about volunteer opportunities. Ready for an extended field trip? North Carolina is home to 6 coastal State Reserve sites, including two that are located on the Outer Banks (Buxton Woods and Kitty Hawk Woods), as well as 4 coastal National Reserves that span from Northern Currituck to just south of Wilmington. Consider an extended discovery of all the natural sites that the Carolina coastline has to offer. Corolla vacationers who love to explore the beaches and forests located well off the beaten path will be well served with a visit to the Currituck Banks Coastal Estuarine Reserve. This unique parcel of land located on the outskirts of the bustling resort communities of Corolla are home to a unique world of diverse habitats, hundreds of migrating birds, and some of the northern Outer Banks' most famous residents, the Corolla Wild Horses. 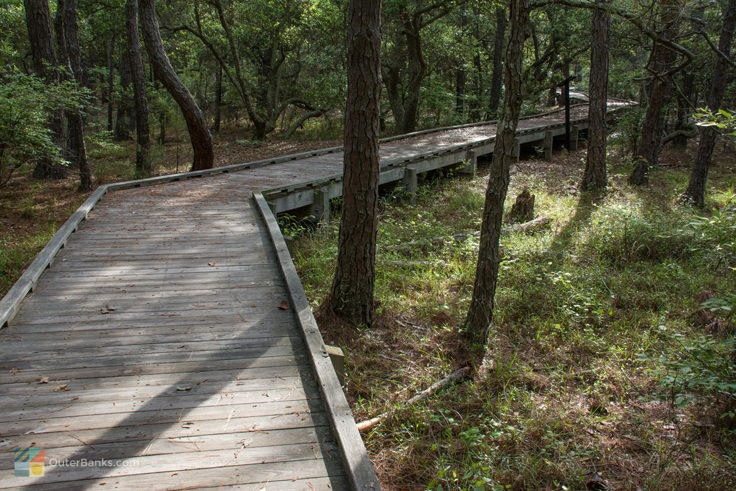 Plan a visit on your next Outer Banks vacation, whether it entails a quiet soundside stroll along the small easy-to-traverse one-third mile boardwalk, or a deep trek into the woods on the 1.5 mile nature trail, and discover one of the Outer Banks's best hidden treasures, and a natural portal into the barrier island environment of centuries ago. 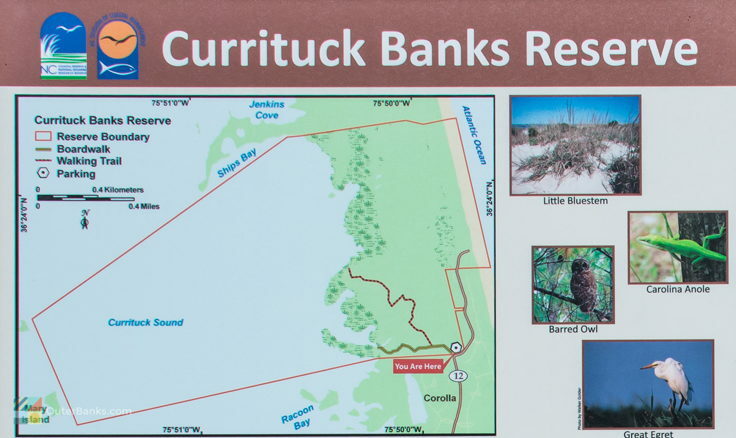 Where is the Currituck Banks Coastal Estuarine Reserve? The Currituck Banks Coastal Estuarine Reserve is located on the northern edge of Corolla, effectively beginning where the paved road ends. 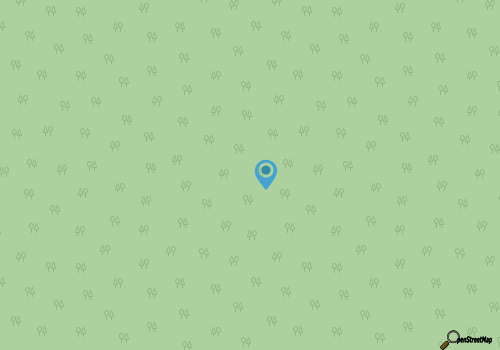 It extends north until it connects with another undeveloped and wild parcel of northern Outer Banks land, the Currituck National Wildlife Refuge. How do you get to the Currituck Banks Coastal Estuarine Reserve? Visitors can head north on Highway 12 until they almost reach the end of Corolla. 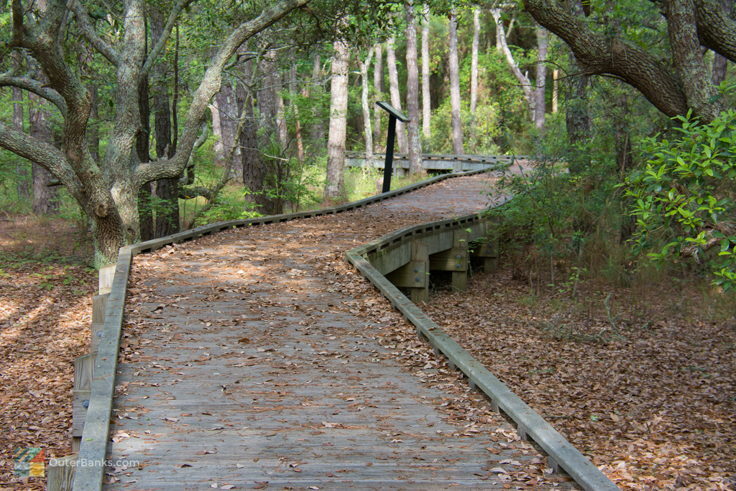 A small parking area and hiking trail that leads to the Currituck Banks Coastal Estuarine Reserve is located where Ocean Trail turns into North Beach Access Road. Is there parking at the Currituck Banks Coastal Estuarine Reserve? There is a small paved parking area at the merging of Ocean Trail and North Beach Access Road in the town of Corolla, which is next to a trailhead. Visitors can also find rustic and unmarked parking throughout the northern 4WD area of the Outer Banks. Do you need a 4WD vehicle to get to the Currituck Banks Coastal Estuarine Reserve? A 4WD vehicle is not required to reach the Currituck Banks Coastal Estuarine Reserve, as the reserve’s borders begin in the town of Corolla. For a thorough exploration, however, a 4WD vehicle may come in handy to explore the northern areas of the reserve and the 4WD beaches of Carova. Can you camp in the Currituck Banks Coastal Estuarine Reserve? Camping is not allowed anywhere within the Currituck Banks Coastal Estuarine Reserve. Are there special events at the Currituck Banks Coastal Estuarine Reserve? While there are typically very few if any guided tours or events within the Currituck Banks Coastal Estuarine Reserve, the North Carolina Coastal Reserve and National Estuaries Research Reserve system hosts varying events throughout the Outer Banks and beyond. Visit their website at http://portal.ncdenr.org/web/crp/currituck-banks for details. Where can you stay at the Currituck Banks Coastal Estuarine Reserve? The town of Corolla and the 4WD area of Carova have a number of vacation rental homes that can range from small cottages to grand estates with 12 or more bedrooms. In addition, the town of Corolla also has a variety of hotels, motels, and resorts for vacationers. Are there restaurants near the Currituck Banks Coastal Estuarine Reserve? The town of Corolla, which serves as the southern border of the Currituck Banks Coastal Estuarine Reserve, has dozens of restaurants for visitors. Folks travelling to the northern regions of the Currituck Banks Coastal Estuarine Reserve however, (past where the paved road ends), will find that there are no restaurants or commercial businesses of any kind in the 4WD area. Are there restrooms at the Currituck Banks Coastal Estuarine Reserve? 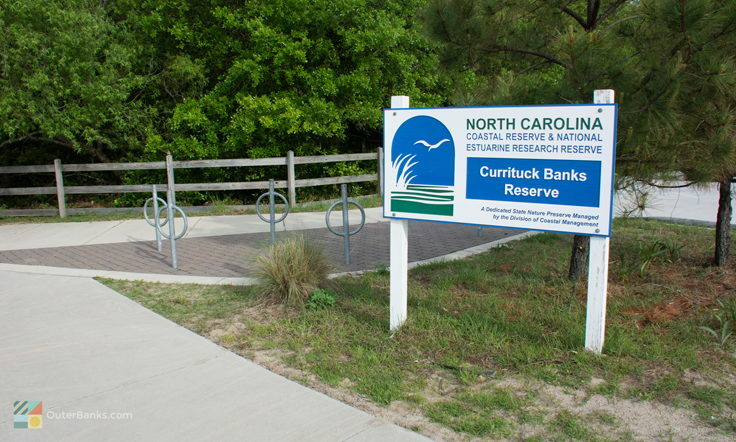 There are no public restrooms at the Currituck Banks Coastal Estuarine Reserve. Are there mosquitos at the Currituck Banks Coastal Estuarine Reserve? Mosquitos can be thick in the Currituck Banks Coastal Estuarine Reserve, especially in the warm weather months from mid-spring until mid-fall. Seasonal visitors will want to pack along plenty of bug spray, especially on warm sunny days with little to no wind. In the winter months, however, the northern Outer Banks area and the Currituck Banks Coastal Estuarine Reserve is relatively mosquito-free. Are there snakes at the Currituck Banks Coastal Estuarine Reserve? There are snakes within the Currituck Banks Coastal Estuarine Reserve, so visitors will want to use caution, particularly in regards to the two poisonous species that can be found in the area – the cottonmouth (or water moccasin) and the copperhead. 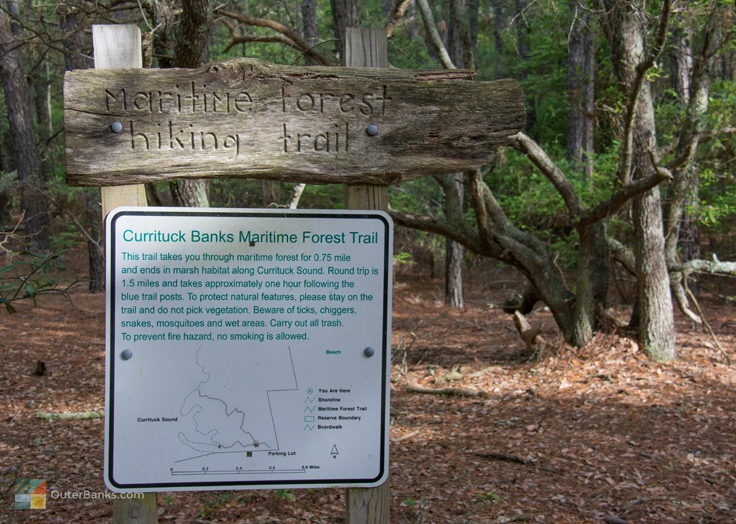 Are there hiking trails at the Currituck Banks Coastal Estuarine Reserve? There are two readily available hiking trails that can be reached via the trailhead at the southern portion of the reserve, off of Highway 12. 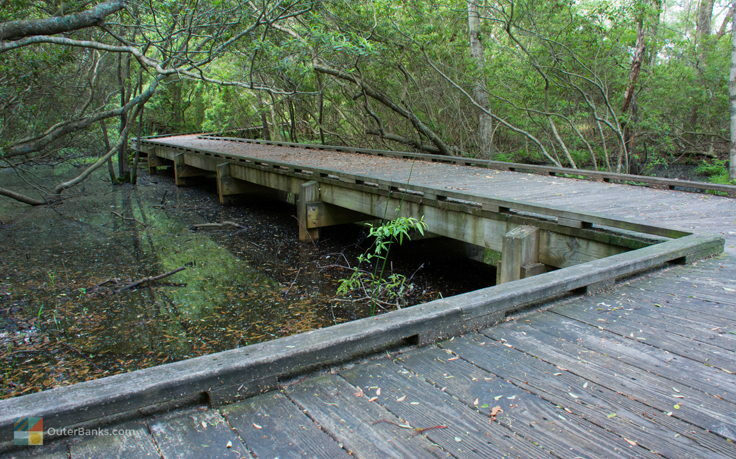 The first is a roughly .5 mile handicapped accessible boardwalk that leads to a view of the Currituck Sound, and the second is a more primitive 1.5 mile long trail that ventures away from the boardwalk and goes north through the heart of the reserve until it also connects with the Currituck Sound. Where are the birding spots at the Currituck Banks Coastal Estuarine Reserve? 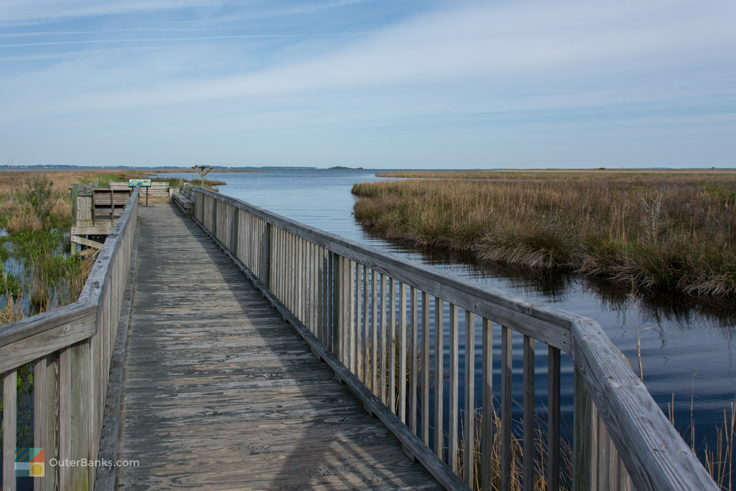 Birdwatchers will want to flock to the roughly .5 mile long boardwalk that’s located in the town of Corolla on the southern edge of the Currituck Banks Coastal Estuarine Reserve. 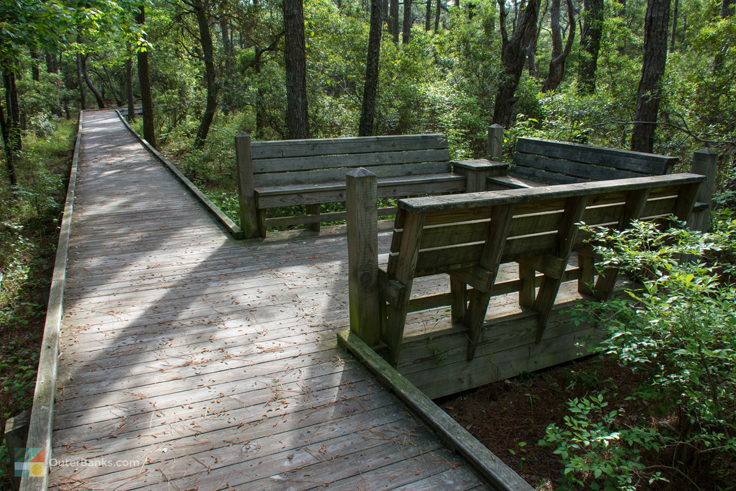 This handicapped accessible walkway leads to several viewing areas in the maritime forest, marshes, and on the edge of the Currituck Sound. How large is the Currituck Banks Coastal Estuarine Reserve? The Currituck Banks Coastal Estuarine Reserve is 965 acres in area. What kind of birds are in the Currituck Banks Coastal Estuarine Reserve? There can be hundreds of different kinds of birds in the Currituck Banks Coastal Estuarine Reserve, as the diverse habitats can host a wide array of species. Look for plovers, sandpipers, terns and pelicans along the beach and dune areas, songbirds, owls, hawks and bald eagles in the maritime forest, and herons, egrets, rails and the belted kingfisher in the marshes and estuaries. What is the landscape like at the Currituck Banks Coastal Estuarine Reserve? The landscape within the Currituck Banks Coastal Estuarine Reserve is unique, and features sandy beaches and dunes, brackish marshes, maritime forest, and soundfront terrain. 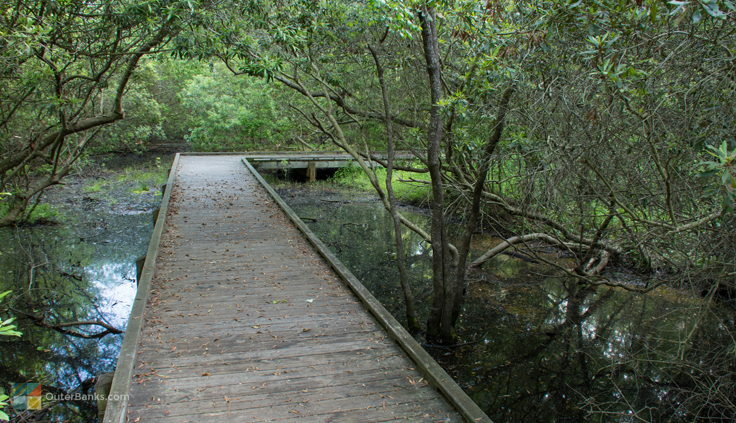 Two walking trails within the reserve, which are found in the town of Corolla, cover a nice sample of these varying landscapes. Are there wild horses at the Currituck Banks Coastal Estuarine Reserve? The famed wild horses of the northern Outer Banks may make appearances in the northern regions of the Currituck Banks Coastal Estuarine Reserve and the adjacent Currituck National Wildlife Refuge. They are specifically found in the 4WD section of the barrier island shoreline, and are often spotted along the beach or in the nearby sand dunes. How can you see the wild horses at the Currituck Banks Coastal Estuarine Reserve? Visitors can drive a 4WD vehicle north of Corolla for a chance to view the wild horses of the Outer Banks, or can book a tour through several locally owned businesses and community organizations, like the Corolla Wild Horse Fund, which are located in the town of Corolla. Can you pet or take photos of the wild horses at the Currituck Banks Coastal Estuarine Reserve? 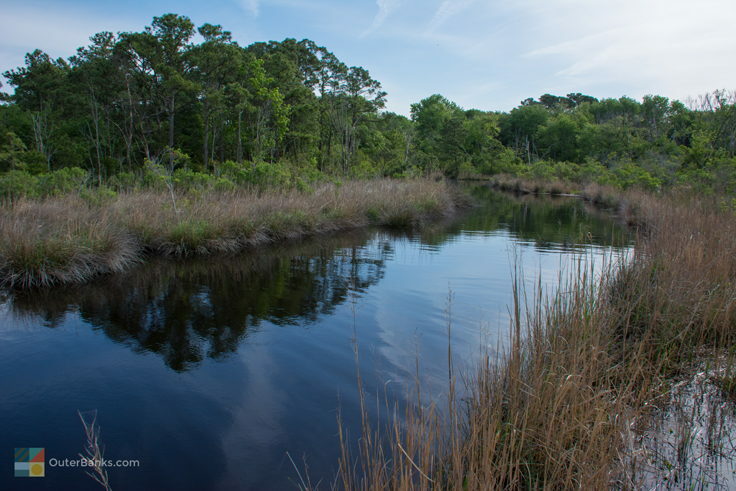 Can you boat or kayak at the Currituck Banks Coastal Estuarine Reserve? When is the best time to visit the Currituck Banks Coastal Estuarine Reserve? Many longtime visitors attest that the best time to visit the Currituck Banks Coastal Estuarine Reserve is in the fall, winter, and early spring months, when migrating birds and wintering waterfowl may make an appearance, and when mosquitos and other bugs are at a minimum. That said, the Currituck Banks Coastal Estuarine Reserve can be accessed and enjoyed all year long. Can you fish at the Currituck Banks Coastal Estuarine Reserve? Fishing is allowed in the waters that border the Currituck Banks Coastal Estuarine Reserve, however all state rules and regulations apply, and visitors must have a North Carolina Saltwater Fishing License to fish all along the Outer Banks. Can you hunt in the Currituck Banks Coastal Estuarine Reserve? Hunting is allowed by permit within the Currituck Banks Coastal Estuarine Reserve at certain times of the year. All state and federal hunting regulations, in addition to reserve regulations, apply. When is the Currituck Banks Coastal Estuarine Reserve open? 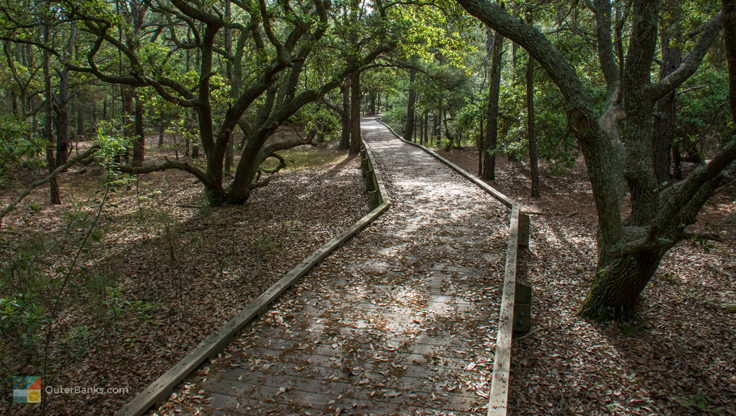 The Currituck Banks Coastal Estuarine Reserve is open year round, and visitors can access the trails that launch from the town of Corolla at any time. Can you bring your pet to the Currituck Banks Coastal Estuarine Reserve? Pets are allowed within the Currituck Banks Coastal Estuarine Reserve, but must be leashed at all times. Visitors must also clean up after their pet while exploring. Can you have a fire at the Currituck Banks Coastal Estuarine Reserve? Fires are not permitted anywhere within the Currituck Banks Coastal Estuarine Reserve.